Fallaci was born in Florence, Italy. During World War II, she joined the resistance despite her youth, in the democratic armed group "Giustizia e Libertà". Her father Edoardo Fallaci, a cabinet maker in Florence, was a political activist struggling to put an end to the dictatorship of Italian fascist leader Benito Mussolini. It was during this period that Fallaci was first exposed to the atrocities of war. The demonstrations by immigrants in the United States these past few months "disgust" her, especially when protesters displayed the Mexican flag. "I don't love the Mexicans," Fallaci said, invoking her nasty treatment at the hands of Mexican police in 1968. "If you hold a gun and say, 'Choose who is worse between the Muslims and the Mexicans,' I have a moment of hesitation. Then I choose the Muslims, because they have broken my balls." 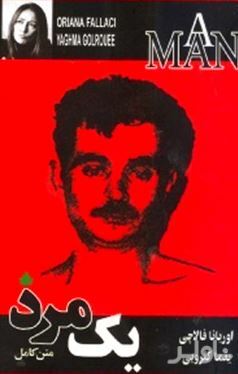 In the late 1970s, she had an affair with the subject of one of her interviews, Alexandros Panagoulis, who had been a solitary figure in the Greek resistance against the 1967 dictatorship, having been captured, heavily tortured and imprisoned for his (unsuccessful) assassination attempt against dictator and ex-Colonel Georgios Papadopoulos. Panagoulis died in 1976, under controversial circumstances, in a road accident. 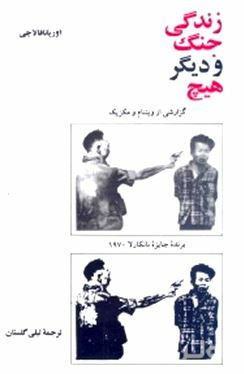 Fallaci maintained that Panagoulis was assassinated by remnants of the Greek military junta and her book Un Uomo (A Man) was inspired by the life of Panagoulis. During her 1972 interview with Henry Kissinger, Kissinger agreed that the Vietnam War was a "useless war" and compared himself to "the cowboy who leads the wagon train by riding ahead alone on his horse".Kissinger later wrote that it was "the single most disastrous conversation I have ever had with any member of the press." 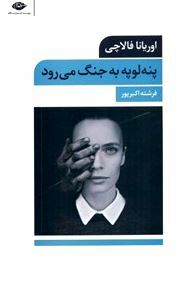 She has written several novels uncomfortably close to raw reality which have been bestsellers in Italy and widely translated. 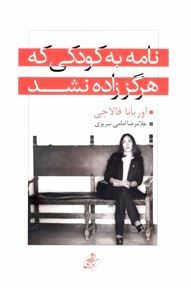 Fallaci, a fully emancipated and successful woman in the man's world of international political and battlefront journalism, has antagonized many feminists by her outright individualism, her championship of motherhood, and her idolization of heroic manhood. In journalism, her critics have felt that she has outraged the conventions of interviewing and reporting. As a novelist, she shatters the invisible diaphragm of literariness, and is accused of betraying, or simply failing literature. 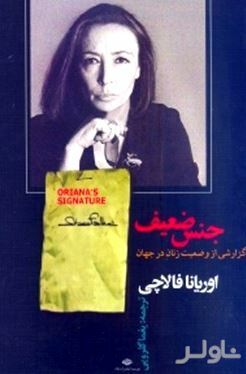 Fallaci has twice received the St. Vincent Prize for journalism, as well as the Bancarella Prize (1971) for Nothing, and So Be It; Viareggio Prize (1979), for Un uomo: Romanzo; and Prix Antibes, 1993, for Inshallah. She received a D.Litt. from Columbia College (Chicago). She has lectured at the University of Chicago, Yale University, Harvard University, and Columbia University. 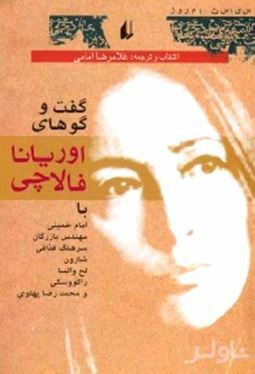 Fallaci’s writings have been translated into 21 languages including English, Spanish, French, Dutch, German, Greek, Swedish, Polish, Croatian and Slovenian. 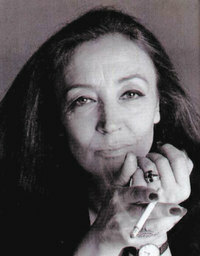 Fallaci was a life-long heavy smoker. She died on September 15, 2006 in her native Florence from breast cancer. 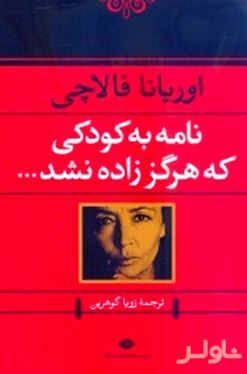 من برای شناخت بشریت به اینجا آمده ام، به خاطر اینکه دلم می‌خواهد بفهمم مَردی که مَرد دیگری را می‌کشد، در جست و جوی چیست و وقتی که آخرین گلوله را در بدن مَردی فرو می‌کند به چه می‌اندیشد، من برای ثابت کردن عقیده ای که همیشه به آن معتقد بوده ام به اینجا آمده ام و آن پوچی و احمقانه بودن جنگ است و فکر می‌کنم جنگیدن، قاطع‌ترین دلیل حماقت بشر است.